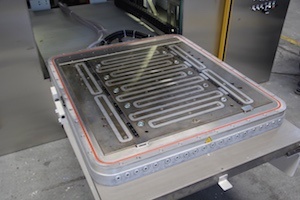 As some work pieces have to be given a Teflon core, the lower magnetic clamping plate (in photo) with the corresponding mould half can be pulled out to the front. The lower magnetic clamping plate is pushed in. 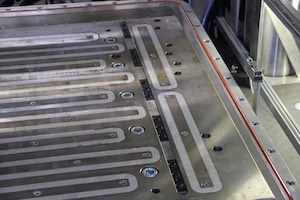 The mould can be easily pushed in on the roller strips in the grooves of the magnetic plate. 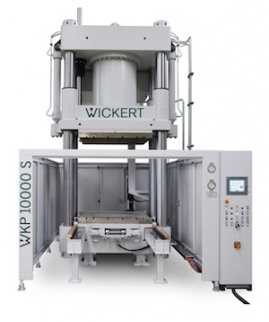 : Wickert WKP 10000 S compression press. Machine engineering company Wickert Maschinenbau GmbH, turned to Roemheld’s latest magnetic clamping technology to ensure compliance with the latest EN safety regulations. To date, M-TECS magnetic clamping plates are the only ones with a control system that meets the high demands of the new EN 289 safety standard, which came into force at the beginning of 2014. Wickert installed the latest version of the quick-clamping technology, for the first time, on a compression press for the production of pharmaceutical stoppers. Their customer was a company in the USA which sometimes produces very small batches under white room conditions. Thanks to the technology, the customer has saved more than two hours' tooling time at each of the frequent mould changes. The WKP 10000 S press, with its 10,000 kN press force, is being used to produce caps for medication packages and plungers for injections with diameters between 6 and 16 mm. Production takes place in a white room, meeting the requirements of ISO Class 7. The American pharmaceuticals company processes an elastomer, developed in-house, whose properties are adapted to the medications with which the work pieces come into contact. Air pockets, that occur in the starting material during kneading, are eliminated in a vacuum chamber. The elastomer vulcanises at a temperature of 180°C to 210°C. As the dies used are only 2" (5 cm) thick in some cases and require a plane parallelism with a tolerance of only 0.1 mm over the whole press platen area of 1,000 x 1,000 mm, they have to be clamped absolutely level. Equally as important, is the homogeneous distribution of the temperature; it must not deviate by more than ± 1°C over the whole area during forming. A further demand on the clamping devices is made by the geometry of the tools used: Some work pieces are given a Teflon core; the moulds used here have up to 3,500 cavities so that high clamping forces are required for secure holding. The lower mould half can also be pulled out to the front for loading. "In our experience, magnetic clamping technology satisfies these demands best," says Thomas Klimpl, Sales Engineer and Head of Marketing at Wickert Maschinenbau GmbH, explaining the reason for the decision in favour of the clamping plates. Together with Andreas Reich, Head of Work holding Technology at the Hilchenbach works of the clamping technology specialists, Roemheld, he has advanced the implementation of the new press standard in practice. The current order is the first joint project in which magnetic clamping plates have been used, together with the control system adapted to the new regulations. Andreas Reich explains: "We have designed the new control system so that it fully satisfies the demands of the interface with safety category IV or performance level "d" and "e" of the press standard EN 289." The two know one another from the many year of co-operation between the two companies. Thomas Klimpl, who originally began at Wickert as a design engineer, estimates that around 200 M-TECS magnetic clamping plates from Roemheld are in use on Wickert presses: "We have a large number of customers from the aerospace industry where small quantities are frequently produced. With frequent tool changing, the magnetic clamping technology is unbeatably fast." The operating temperatures of generally above 150°C also speak in favour of the technology. Hydraulic clamping elements are seldom used at Wickert for the same reason. The company uses Roemheld M-TECS 230 magnetic clamping plates on the press that is suitable for a maximum operating temperature of 230°C. Tools and dies of any size and shape can now be clamped quickly, safely and precisely; virtually without weight limits. The plate thickness lies between 47 mm (without heating unit ) and 85 mm with integrated heater, an option that Wickert prefers for all presses. The size and geometry of the plates can be freely adapted to meet the requirements of the application. To Wickert's pharmaceuticals customers, short tooling times on the press are extremely important. The moulds for the production of the different products are changed at least once per shift. In addition, the mould has to be removed for cleaning every four to six weeks. The producer has therefore developed a concept for rapid tool changing himself with preheating furnace, feeder, loading and removal. 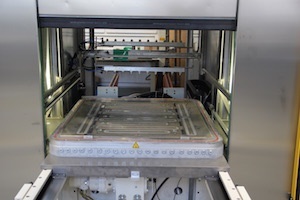 The magnetic clamping technology fits perfectly into this concept, as it allows the mould to be removed and installed again in just twenty minutes. "Compared with the two and a half hours that manual changing took without these aids, that is a great improvement. In the 130 minutes that you save on tooling with the quick-clamping technology, the press can be up and producing again," says Klimpl. Some customers faced with the magnetic clamping technology for the first time have reservations about safety in the beginning. But Andreas Reich explains: "The interface to the magnetic plate controller is one hundred percent tested and accepted. It ensures that the press stops immediately in the event of a fault so that the mould is not damaged. In the case of systems clamped mechanically with bolts, on the other hand, it continues to operate and in the worst case the bolts shear off any the mould is damaged." The magnets require electricity only for a few seconds to clamp and release the tool so that the system is safe even in the event of a power failure. Once clamped, the permanent electromagnet holds even mould halves weighing several tonnes exactly in position, without distortion and parallel. In view of the large number of cavities in the moulds on the current press, Wickert decided in favour of a clamping force of 31t. The uniform magnetic field guarantees a stable and level position of the mould, thus minimising quality deviations and scrap. It also ensures that the press forces are uniformly transmitted, and thus guarantees high precision and process reliability. The separate control of the magnetic plates permanently monitors the relevant parameters, such as position of the mould, temperature and magnetic force. It can be easily integrated into the press control system. Wickert installs the press in the customer's works in such a way that the operator works with protective clothing inside the white room and the moulds weighing around 600 kg per half are changed by another employee outside the white room on the rear side of the machine. This employee switches off the power by pressing a button on the controller of the magnetic clamping plate and can then remove the old mould from the press chamber while still hot, using a hook and integrated roller strips. It can then be removed from the hook and placed into a rack for cooling. He then collects the new mould from the preheating station and pushes it into the machine on the roller strips. A lateral and middle centering device simplifies the positioning. Pressing the button again finally clamps the mould against the magnetic clamping plate. This current press comes from the WKP S Series that was specially developed for the production of individual elastomer mouldings and therefore has a special vacuum chamber that ensures particularly high process reliability. The company also offers special press ranges for the processing of other plastics, composites and materials such as powders, grinding wheels, and brake and clutch linings. Special machines and presses for laboratories complete the range. Wickert covers a spectrum that ranges from simple presses with manual operation through hydraulic machines right up to fully automated systems. Four-fifths of the 80 -120 presses sold per year are for export, most of which are for customers in Central and Northern Europe, the USA and Canada. In 2013 Wickert generated a turnover of around EUR 2 million with 135 employees. In order to maintain the leading technological position, roughly one-quarter of the workforce are employed in the Development department. All the machines are produced by Wickert individually to the customer's specifications using a modular system at the company's headquarters in the Rhineland Palatinate. It is therefore easily possible to optimise an elastomer press for the desired process, whether for compression moulding (CM), transfer moulding (TM) or injection transfer moulding (ITM).